Tropic Lightning Museum Remembers the History of the 25th Infantry Division. Tropic Lightning Museum Remembers 25th I.D. History! As the name implies, the Tropic Lightning Museum on Schofield Barracks, Hawaii remembers the proud achievements of the U.S. Army’s 25th Infantry Division. 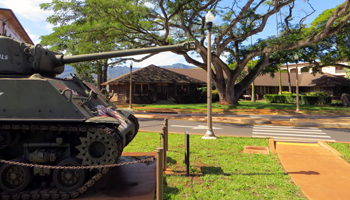 It also showcases military memorabilia from more than 100 years of Schofield Barracks history. 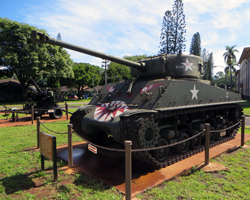 As a result, this small Hawaii museum may not appeal to all Hawaii vacationers; but for anyone who served with the “Tropic Lightning” Division, this is a place to commemorate your service and share your pride with any family or friends who might be traveling with you. It could be a very meaningful part of your family vacation in Hawaii. Beyond those who have personal ties to Schofield Barracks, though, the Tropic Lightning Museum is probably too small to make a special trip out into the middle of the island. 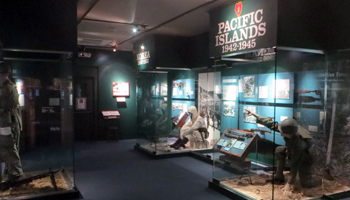 If you’re just interested in Hawaii history or Hawaii’s military history, there are several Hawaii museums, including bigger military museums such as the free U.S. Army Museum of Hawaii at Fort DeRussy in Waikiki, the two free museums at the USS Arizona Memorial at Pearl Harbor, and the Pacific Aviation Museum (not free) on Ford Island in Pearl Harbor. But regardless of the museum’s small size and collection, this Hawaii attraction can still be a fun learning experience. The building itself is one of the most historic structures on Schofield Barracks. Initially constructed as the post library, it is the only edifice built with lava rock walls. Surrounding the exterior of the building, you can see military combat equipment such as a Sherman tank, howitzers, a Vulcan air defense system, and more. Then when you go inside, there’s a period display for every conflict in which the 25th Infantry Division has fought. If you have a valid military ID, it’s easy to visit the Tropic Lightning Museum. Just drive up to any of the four gates that enter Schofield Barracks. There are two gates along Kunia Road, and there are two more gates along Wilikina Drive (the H2 freeway becomes Wilikina Drive when the freeway ends). However, if you do not have a valid military ID, you’ll need to go the Lyman Gate, which is located along Kunia Road. If you follow the H2 freeway until ends, you’ll then need to turn left on Kunia Road and then drive to the second post entry gate on your right. That’s the Lyman Gate. Tell the guard that you want to visit the Tropic Lightning Museum, and you’ll be directed to the visitor passes station. Just make sure everybody in your vehicle has a valid photo ID, and you have your driver’s license, motor vehicle registration, insurance, and safety check or rental car agreement. Once you get your post entry pass, drive straight up Lyman road to Flagler Road. Turn Right, and follow Flagler through two intersections to the round-about. You’ll see the tank directly in front of you and the museum on your left. Parking is along the right side of the building, and there’s plenty of it. After you’re done, and since you’re in the area, you could easily go to the nearby Dole Pineapple Plantation and the Kukaniloko Birthing Stones.